And yes, these are present in impressive amounts on our sandy beaches. But what do we know about this problem in our coastal areas? Over the past five years, my research group at the Department of Biology and other entities at the University of Malta and the ERA have been producing some preliminary results. During 2016/17, a detailed investigation of floating marine litter in coastal and inshore waters in Malta and Gozo was conducted, partly in connection with our EU obligations for the Marine Strategy Framework Directive. The graphic on right shows the distribution of floating litter. This suggests that most of the floating litter in our coastal waters does not necessarily originate from seasonal activities, such as those related to tourism, which are more intense in summer. As expected, the floating litter densities in harbours and bays were higher, by a factor of two to five times for summer and winter. In fact, the coastal part of Malta that apparently has the highest densities is Marsaxlokk harbour and its approaches. 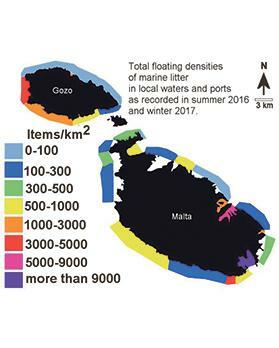 Evidently, port operations, as well as the intense urban densities around Marsa-xlokk, are bound to contribute significantly to high densities of floating litter. Floating plastic litter often ends up stranded on the shoreline, and natural fragmentation processes lead to the production of microplastics. In 2015 and 2016, five sandy beaches were investigated – Għadira Bay, Golden Bay, St George’s Bay, Għajn Tuffieħa Bay and Pretty Bay. The highest levels of microplastics were reported in Pretty Bay, being 15 times higher than the lowest reported at Għajn Tuffieħa. Significant amounts of micro-plastics were also found in deeper sands (about half a metre deep). Land-based human activities are most likely to be the major contributors to the occurrence of microplastics on local sandy beaches. These include: the frequency of use of the beach, commercial and industrial activity in the area and sources of waste runoff. In fact, the two sites (Pretty Bay and St George’s Bay) located in the midst of intense urban activities had the highest levels of microplastics. Most of such microplastics were of a secondary type, resulting from the fragmentation of primary plastic products (being mostly composed of polyethylene) and paint fragments. The local occurrence of microplastics seems to be lower compared to other European locations studied so far. This may be due to the size range of microplastics investigated locally, as well as the regular beach cleanups and other factors. Some interesting points: paint fragments were most common at Pretty Bay, due to ship repairs; primary microplastics in the form of production pellets (used for the production of plastic articles) were quite abundant, especially in Għajn Tuffieħa Bay in the summer of 2016. These plastic pellets are probably not released from local land-based sources but by passing ships or, at least, from abroad. So yes, the plastics that we dump into the sea return to our waters and shores. The Environment and Resources Authority is committed to understanding even better the nature and extent of this problem and doing something about it. For example, we are assisting the Ministry for the Environment, Sustainable Development and Climate Change in initiatives to curb the use of single-use plastics. Victor Axiak is chairman of the Environment and Resources Authority.